Designed specifically for the Boeing 777 aircraft, the GE90 is the world’s most powerful turbofan engine. In 1995, the GE90 engine debuted aboard a British Airways 777 airplane along with commercial aviation’s first-ever carbon-fiber composite fan blades. Early GE90 engine models boasted outputs between 74,000 and 94,000 lbs. of thrust, and today it remains the world’s largest turbofan engine. 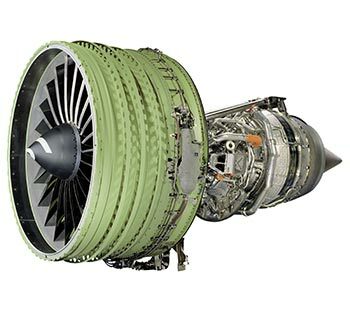 GE has continued to improve upon the GE90 design with larger variants (-110B and -115B) built exclusively for Boeing’s largest 777 models (777-200LR and 777-300ER). The GE90 is now the best-selling engine for that aircraft family. Safran Aircraft Engines of France, Avio Aero of Italy and IHI Corporation of Japan are all revenue-sharing participants in the GE90 program. 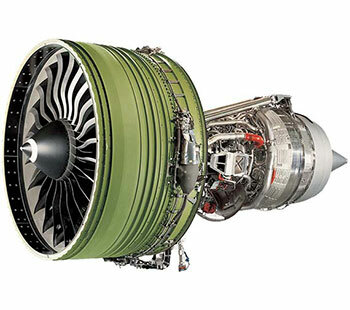 With the GE90, GE introduced the composite fan blade—the first-ever in commercial aviation. Measuring more than four feet long and weighing less than 50 pounds, the GE90 fan blade is made from carbon fiber and a toughened epoxy matrix that delivers double the strength and one-third the weight of titanium. 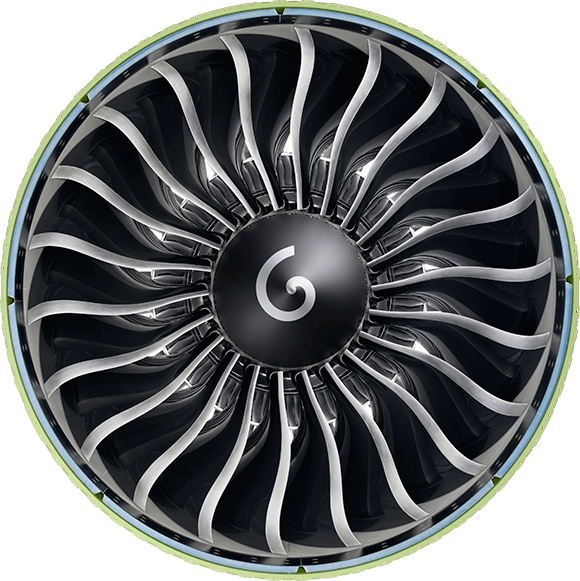 The GE90 fan blade’s uniquely curved design makes it larger, lighter and more aerodynamic than traditional titanium blades for reduced engine weight and lower fuel burn. Plus, the aerodynamic design allows the GE90 fan blade to pull large amounts of air into the engine, making it quieter and more efficient while generating unrivaled thrust. A later variant, the GE90-115B fan blade, was introduced into New York’s Museum of Modern Art in 2007 as a perfect example of cutting-edge engineering, design and beauty. During certification testing in 2002, the GE90-115B engine set a world-record 127,900 lbs. of thrust. The GE90-115B ran for approximately 60 hours at triple red-line conditions (maximum fan speed, core speed and exhaust gas temperature) to evaluate the engine at its operational limits and demonstrate its capability beyond the most extreme operating conditions. Available for the GE90 engine family, the GE TRUEngine program helps operators maximize operational reliability by maintaining all engine components to GE maintenance standards and recommendations. The TRUEngine designation can also result in as much as 50% higher residual value and enable easier evaluation of engine configuration, asset value and market attractiveness. The program is voluntary, there’s no cost to participate, the TRUEngine designation is fully transferrable, and operators can use any MRO shop for their overhauls. Rated at 94,000 lbs. of thrust, the GE90-94B engine builds on the proven success of the early GE90 engine models and powers the Boeing 777-200 and 777-300 aircraft. After being selected by Boeing to develop an engine with 110,000 to 115,000 lbs. of thrust, GE delivered the GE90-115B engine, which now powers the longer-range Boeing 777-200LR, 777-300ER and 777 Freighter aircraft.